Time flies swiftly and we’ve come to the tail end of 2012. The last month of the year - December is the period when we celebrate Christmas season. It is the time of the year where every place is filled with a joyful spirit whether at home, office, school, entertainment or shopping facilities. Happy moods created by yuletide decorations like colorful Christmas lanterns, beautifully decorated Christmas trees, Christmas lights overflowing in malls and major city streets and more. Christmas parties held in schools and offices, exchanging gifts, dining and playing parlor games. The best time to show gratitude through gift-giving and sharing of blessings. Children most especially are the happiest during this season being showered with lots of “aginaldos” (presents) from their godparents. The traditional music (Christmas songs) played during this time of the year generates a light and happy mood. Carolers abound singing Christmas songs from house to house at the strike of 6 p.m. The simbang gabi or midnight mass that starts on the 16th day up to the 24th day of the month. Indulgence, as many parties are held, food festivals are everywhere. 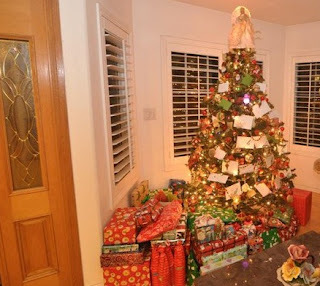 The Christmas season is the time where most families and relatives gather together for the customary family reunions. Christmas time is traditionally a long occasion for merry-making. What about you, what makes you merry during the Christmas season?